soooo, my dear readers, if you are like me, and have been pining after that iconic Isabel Marant 'bator' coat from seasons ago, it has re-appeared in this season's etoile line as the 'xavier' coat. i am a selective fan of IM pieces, and this one has been on my wishlist forever. a jacket/coat like this epitomizes how the sophisticated woman really wants to dress all the time. it's for the woman who dresses for herself (and other women) first and foremost. is there something Man Repeller-ish about it? absolutely. the genius thing about the Isabel Marant bator/baki/xavier is that it's loose, boxy, and deflects the mainstream male gaze (that obnoxiously dictates that women should dress at all times to exhibit their figures) from all angles. it's alluring and a perennial favorite - i imagine Coco Chanel would have one too if she were a downtown girl these days. the 3 c's of confident, comfortable, and chic are all embodied in this one unassuming, yet indispensable item of clothing. you kind of imagine it's your boyfriend/husband/lover's coat that you stole, and yet it fits and drapes just so. also, the color is a goes-with-everything neutral that flatters all skin tones: a gorgeous textured grey tweed. exactly what is missing from my small collection of coats and jackets. i had a blazer in this tweed from H&M some years ago, but it was a bad poly/wool blend and the fit was wonky. the fabric looks like it's a fine quality bouclé wool and alpaca: 68% wool, 20% alpaca, 12% polyamide / lining: 100% cotton / padding: 100% polyester. as you know i am a bit of a natural fibers fanatic, so this predominantly wool/alpaca blend passes the test with flying colors. as does the all-cotton lining. nothing irks me more than an icky acetate or polyester lining on an expensive jacket. i'm also intrigued by the padding - it looks like such a cozy blazer/blanket coat, no? i would wear this a million ways - with steven alan shirts/black skinnies/ankle boots now; with a sequin top/leather leggings/heels for a night out in dead of winter; with a dress and pointy-toe flats in spring...the list goes on. the holidays are coming up, so this is my splurge purchase/gift to myself for the season. I've had a huge amount of wear out of my Bator! It goes with everything and I always feel good in it. I would say it's only downfall is the fact that it pills a lot and I've had to de bobble it a few times. @Alexandra what kind of material is your bator? is it also a tweed? i think last year's baki was a bit of a different material as well. i have an expensive sweater shaver from Japan that i bought to de-pill nice knits, so that'll come in handy perhaps with this! My own Bator is (barely) starting to pill but otherwise it still looks great even after years of use. I love it and have my eye on it but not sure what the sizing is like? Can anyone chime in? I'm a size 4-6 so I'm thinking maybe the size 2? i love my baki coat. it really does go with everything. the loose style allows for lots of layering, which i really appreciate since that means i can wear it well into winter (with a zillion sweaters underneath!). The Xavier is a nice coat but it's really not like bator. It's more straight fit while the bator is more of an inverted triangle. The pockets are also quite different. I own the Bator and tried on the Xavier and preferred the fit of the bator. Regardless, I hope you enjoy your new coat! love that you mentioned the elegance that comes with boxier shapes and loose clothing! it's a conversation i have with my husband quite often. boxy can be quite beautiful! have always loved the baki, but never sought it out. bator is nice too. I think if you liked the coat the last time it came out and regreted not buying it, you should just bite the bullet and get it this one ASAP. I think it's lovely by the way - like you say it will go with a lot of outfits! The Bator is on my wishlist as well, but I only want the Bator, not the Etoile versions. I got the Ben coat last year, and the quality turned out to be horrible - lots of pilling!!! I sold it and got a mainline coat from 2008 instead, and the quality is wonderful. Etoile coats can be very hit or miss, I hope you'll have better luck with this one. @Anonymous ah, thanks for clarifying! yes, it appears that the elusive Bator has been the holy grail...but i think i like the patch pockets of the xavier (better for me, as i tend to stick my hands in my pockets all the time!). IM seems to come out with variations on the bator idea every season, so this seems to be it for this fall. @Jade hehehe. changing men's perspectives, one guy at a time! I love that coat so much! But living where I live it'd very unpractical - unfortunately I could wear it only for 3 weeks a year. :( But if I lived a little bit more south I'd be very tempted. IM definitely does a similar coat every year. In fact, I have the Bator but that was to replace an older IM coat that I should have bought but didn't for some reason. I agree with Garderoben though, her Etoile coats are hit or miss in terms of quality. I would personally wait for a mainline version, but you never know, maybe this will hold up! The funny thing is, I got a bit sick of my coat lately, almost considered even selling it. But you're right, it's very versatile and easy to layer with, so I'll hold on to it for a little longer. @Ginta ahh, yes i think i would need to live in an area that has a real fall/winter, i have too many items of clothing from that season! @Austere hmm i understand what you mean, but i wonder why you think it's a bit 'out there' for your style? i personally find it to be one of the most unassuming low-key items from her collection. fringe wedge boots, now that's an outré statement shoe! i have the baki and love it in spite of the pilling. i tried de-pilling, but it doesn't seem to do much, and the pills somehow just become a part of the fabric. i would have to look at the fabric content to see how it differs from the xavier. it isn't particularly warm, so it's much more of a fall coat for me because i don't like layering it with warm sweaters. i'm pretty sure it's a size 1, and i'm a solid 6 (5'5"). i only wear it with skinny pants and ankle boots because otherwise i feel too shlubby. @erica thanks for chiming in! your comments are really helpful. the xavier has a light padding throughout the coat for a more cocoonish shape, so i'm thinking it will be a cozier early winter option that one can still layer a bunch for even chillier days. Oh, I had my eye on this before purchasing a longer length alternative from apc. 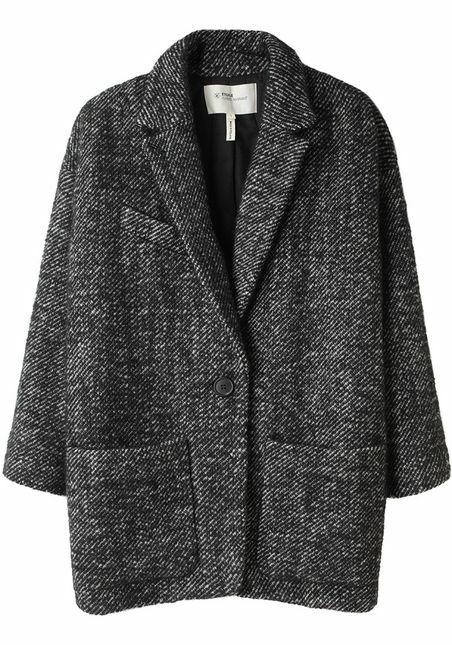 I absolutely love the texture of this coat, so it was difficult to steer away. Does look great layered, as you say....I need to see more pics of it being worn! I received the Istan coat in a size 1 a month back as a birthday present, and loved the fit, but was really sad when I realized that a lack of inside lining would make it fare poorly in the winter months (plus it's pilling like CRAZY and has lots of snagging at the edge). After some saving, I purchased the Xavier in Burgundy as a stand in, and it arrived today! It has a really substantial lining, so that's great for winter. I also like that it seems more "finished" than my Istan with way tighter stitching. I'm short (5'2") and *kind of* curvy, but it's a nice fit. I went with the 0, thinking I may have to exchange for a 1, but it's more oversized than I'd originally thought, so the 0 was great. And I agree with Erica-- wearing my IM coat with skinnier fit pants/jeans is the way to go. Certainly a worthy investment! @lapindelune which one did you get from APC? 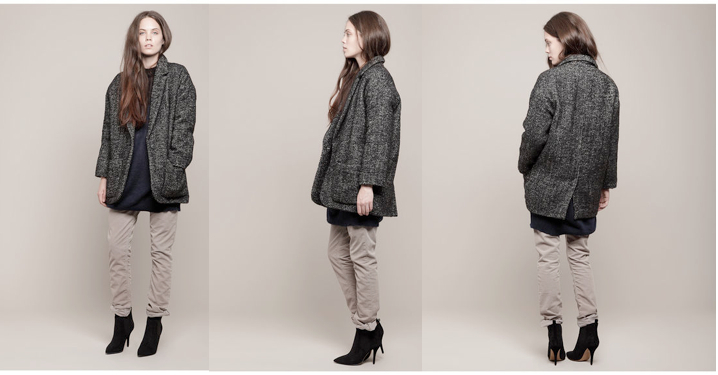 their coats are quite good every season; i have the APC trench and love it. @balkis that's so great to hear. i'm pretty cheap when it comes to coats, so this is a rare splurge for me. i won't be able to get my xavier until my bf visits me in a few weeks, so i'm impatiently waiting to be able to wear it every day. it's so cold now in SH!